A pioneer newspaper from Mashonaland (Northern region of Zimbabwe). 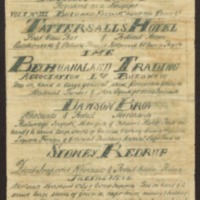 Handwritten and printed with a cyclostyle. The paper focuses on the first Matabele War between troops from the British South Africa Company and the Ndebele Kingdom.